God and money — where’s the balance? Studies show that aside from those in true poverty, money cannot buy happiness. But mismanaging money can definitely lead to unhappiness. On the one hand, it’s easy to see where Prosperity Theology comes from. Take a few promises of the Mosaic covenant out of their national context, take the promise in Malachi 3 about throwing open the storehouses of heaven, mix in some of Jesus’ statements about receiving whatever you ask for in faith, and you can bake up a little health and wealth gospel. On the other hand, it’s possible to come up with an imbalanced Austerity Theology. Point out that Jesus had nowhere to lay his head, turn to the story of the rich young ruler, stir in the parable of the rich fool, and you’ll have a theology that says money is bad and so are those who have it. As always, you want to read the passages in the immediate context and the larger context of the entire Bible. 3. The rich and poor are more alike than they think (Prov. 22:2; 29:13). You can’t understand the biblical view of money unless you are prepared to accept a number of truths held in tension. You’ll probably acquire more money if you work hard and are full of wisdom. But if all you care about is getting more money, you are the biggest fool. Money is a blessing from God, but you’ll be more blessed if you give it away. God gives you money because he is generous, but he is generous with you so that you can be generous with others. And if you are generous with your money, God will likely be more generous with you. It is wise to save money, but don’t ever think money gives you real security. Wealth is more desirable than poverty, but wealth is not as good as righteousness, humility, wisdom, good relationships, and the fear of the Lord. I encourage you to read the whole post and subscribe to Kevin’s blog. He does great work. In the previous post I noted how a Mom was suing a pro-life group for using daughter’s photo in “racist, defamatory” NYC billboard. That, along with a comment on a friend’s Facebook page accusing Tea Partiers of racism got me thinking about which party is most racist. 1. The Democratic Party is the Abortion Party. They recently gave up $40B of budget cuts to save less than $0.5B of money for Planned Parenthood. Meditate on that: Democratic politicians and false teachers* thought it was eighty times more important to keep funding Planned Parenthood than they did to (allegedly) help the poor. And I assume my loyal readers aren’t foolish enough to buy the “but the money went to non-abortion services” line. Money is fungible, folks. And even so, are PP’s non-abortion services eighty times more powerful than the rest of what was getting cut? This was reminiscent of how the same leaders were willing to sacrifice the entire Obamacare Bill rather than have an allegedly redundant Stupak Amendment added to it. Man, they really love abortion. 2. 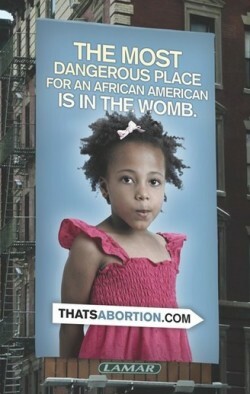 Abortionists target the black community and their rate is three times that of whites. Compare this to the “evidence” against the Republican fringe who wanted to see Obama’s birth certificate** and how some folks viewed that as a sure sign of racism. Please remember these sound bites: The Democrats and theologically liberal “Christians” do dramatic fasts and moan about wanting to help the poor, but they gave up eighty times the money to keep Planned Parenthood fully operational. They risked the entire health care bill rather than add an allegedly redundant amendment banning taxpayer-funded abortions. They are the Abortion Party. And those abortions kill blacks at a rate three times that of whites. Never let them play the race card without mentioning these things. ** BTW, if the WordPress search engine can be trusted, this is the first time I’ve mentioned his birth certificate on this blog. Whatever the motives of the “birthers,” it wasn’t necessarily driven by race. Oh, and guess who started the birther meme? Democrats. I’d say “A.” The racism lies with those Margaret Sanger-inspired Planned Parenthood types who target black communities. I disagree with his premise of Darwinism, of course, but I think he is being consistent with his worldview. If the nothingness-to-molecules-to-Angelina Jolie worldview is correct, then universal ethics would be an illusion. Does the complexity of the Bible mean it can’t be true? If even theologians can not agree what is in the bible and what is the will of the god of christians, how could the general christian population, let alone us who are not christians be expected to? If a god expects humans to make critical decisions on their lives based on some old religious tome (and not on pop lyrics), it is an exercice bound to fail. But consider the criminal on the cross (Luke 23), the woman at the well (John 4) or the Philippian jailer (Acts 16 — “What must I do to be saved?”) as just a few examples. They were saved with the most basic knowledge and approach: Trusting in Jesus. I doubt would they have won any Bible trivia contests. They hadn’t been to seminary, taught Sunday School, etc. But they were saved for eternity. The key themes of the Bible are plain, but as you might expect with the most serious and important topic in the universe, there are complex matters as well. That does not diminish the truth of the Bible at all. I tend to agree with the saying that the plain matters of the Bible are the most important and the most important matters are plain. And the Bible is much more clear than it is made out to be by skeptics. For example, there are over 100 direct and indirect claims that Jesus is the only way to salvation. Are verses like this not clear? 1 John 5:12-13 He who has the Son has life; he who does not have the Son of God does not have life. I write these things to you who believe in the name of the Son of God so that you may know that you have eternal life. 1 Timothy 2:5 For there is one God and one mediator between God and men, the man Christ Jesus. 1 John 2:23 No one who denies the Son has the Father; whoever acknowledges the Son has the Father also. John 14:6 Jesus answered, “I am the way and the truth and the life. No one comes to the Father except through me. Why aren’t the ACLU-types going nuts over Lawrence O’Donnell? See Respecting Lawrence O’Donnell : The Other McCain — O’Donnell is mad at Rush Limbaugh and claims to know the Bible better than him (I don’t look to Rush for biblical interpretation, but that’s another story). But O’Donnell thinks that Jesus’ commands to his followers to give is equal to asking Caesar (aka the government) to take everything from us. Wow. It is the same awful biblical distortions you get from other false teachers*. Here’s a very clear New Testament teaching on giving. You may notice that there is not mention of government. And if O’Donnell & Co. want to claim that this is “just” Paul speaking, then they tip their hands. Jesus is God and the whole Bible is his word. 2 Corinthians 9:6-7 Remember this: Whoever sows sparingly will also reap sparingly, and whoever sows generously will also reap generously. Each man should give what he has decided in his heart to give, not reluctantly or under compulsion, for God loves a cheerful giver. Beyond his abuse of scripture, wouldn’t the Left be alarmed that he wants to force his religious views on all citizens? P.S. to Lawrence and other false teachers — Jesus also claimed to be God and the only way to salvation and that marriage was designed from the beginning to be a union of one man and one woman. Is that part of the message you preach? See BuyCOTT Chick-Fil-A. That’s buycott, not boycott. It is collectively showing appreciation for a company by purchasing their products or services – the opposite of a boycott. Several left-wing activist blogs launched an all-out attack on Chick-fil-A. They mocked and belittled the company’s “Not Open on Sunday” policy. Users of Facebook organized witch hunts on college campuses. All that because one Chick-fil-A franchise donated a few sandwiches to a seminar aimed at helping couples strengthen their marriages. That reaction certainly seems like making a mountain out of a mole hill. You get the sense that there’s more to this attack on Chick-fil-A than meets the eye. And you’re right. There is. Chick-fil-A operates on Biblical principles and that irritates secularists. Chick-fil-A plays Christian music in its restaurants … exclusively. Chick-fil-A closes all its locations on Sunday … no exceptions. Chick-fil-A’s stated corporate purpose is: 1) To glorify God by being a faithful steward of all that is entrusted to us; and 2) To have a positive influence on all who come in contact with Chickfil-A.